This highest-resolution image from NASA's New Horizons spacecraft shows great blocks of Pluto's water-ice crust which appear jammed together in the informally named al-Idrisi mountains. Image released Dec. 4, 2015. Get ready to be amazed: NASA today unveiled the best-ever images of Pluto, revealing the dwarf planet's varied and exotic landscape in amazing detail. The spectacular photos, which were captured by NASA's New Horizons spacecraft during its historic Pluto flyby on July 14, show close-up views of the dwarf planet's towering water-ice mountains and vast plains, resolving fine details such as layering on individual crater walls. You can see the images in this dazzling flyover video from NASA, which was stitched together by mission team members. "Nothing of this quality was available for Venus or Mars until decades after their first flybys, yet at Pluto, we're there already — down among the craters, mountains and ice fields — less than five months after flyby!" Stern added. "The science we can do with these images is simply unbelievable." New Horizons took the new photos with its long-range camera when the probe was just 10,000 miles (16,000 kilometers) from Pluto's surface. At its closest approach, which occurred 15 minutes after the images were captured, New Horizons came within about 7,800 miles (12,550 km) of the dwarf planet. This highest-resolution image from NASA’s New Horizons spacecraft reveals new details of Pluto’s rugged, icy cratered plains, including layering in the interior walls of many craters. The images boast a resolution of 250 to 280 feet (77 to 85 meters) per pixel, allowing features half the size of a city block to be seen, NASA officials said. 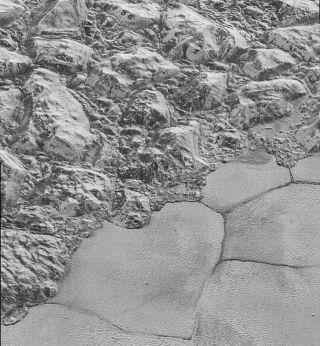 The photos form a strip about 50 miles (80 km) wide that encompasses some of Pluto's ice mountains and a section of the vast nitrogen-ice plain known as Sputnik Planum. "The mountains bordering Sputnik Planum are absolutely stunning at this resolution," New Horizons science team member John Spencer, also of SwRI, said in the same statement. "The new details revealed here, particularly the crumpled ridges in the rubbly material surrounding several of the mountains, reinforce our earlier impression that the mountains are huge ice blocks that have been jostled and tumbled and somehow transported to their present locations." New Horizons beamed home a small fraction of its flyby observations shortly after the July close encounter but kept the vast majority onboard for later transmission. That data dump began in earnest in September, and should continue through August 2016 or so, mission team members have said. The newly released photos are just the first of New Horizons' best-resolution views to reach mission control. More of these images should come down to Earth in the next few days, NASA officials said. This highest-resolution image from NASA’s New Horizons spacecraft shows how erosion and faulting on Pluto have shaped the icy crust of the planet into rugged badlands topography. New Horizons is likely not done exploring the frigid ring of icy bodies beyond Neptune known as the Kuiper Belt. The spacecraft has set a course for a small Kuiper Belt object known as 2014 MU69 and will observe it up close in January 2019, if NASA approves and funds an extended mission.